The guns used in British tanks from their origin in 1916 to the present day fall into three main periods. The first period was between 1916 and 1919, when the tank was in its very infancy, and in this period the fire of the gun(s) was secondary to the shock action of the tank. The second lay between 1919 and 1942, when the tank’s main armament was typically a shot-firing weapon intended primarily for the tank-versus-tank role, with machine guns added for unarmoured targets. The third lay from 1942 to the present, when the tank’s main armament was typically a shot and shell-firing weapon in which the solid shot was the primary anti-tank projectile and the explosive-filled shell was mainly used to tackle entrenched targets such as anti-tank weapons. As before, there were also machine guns to tackle unarmoured targets, low-flying aircraft and infantry. The first part of World War II therefore falls into the second period, and the character of the guns typically installed in British tanks of this period can be traced back to 1923, when the Vickers Medium Tank Mk1 entered service with a 360° traverse turret fitted with the Ordnance QF 2 cwt Mk 1. This was a 1.85-in (47-mm) weapon with a bore length of 31.4 calibres and a weight of 217 lb (98.4 kg), which fired a 3-lb (1.36-kg) shot with a muzzle velocity of 1,750 ft (533 m) per per minute to provide the capability to penetrate 25 mm (1 in) of armour, angled at 30°, at a range of 500 yards (457 m). 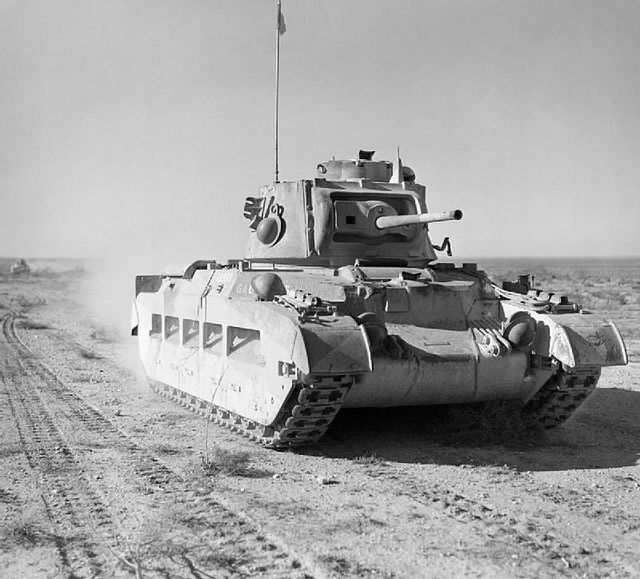 The tank also carried two broadside Vickers machine guns and a third machine gun mounted co-axially with the 3-pdr weapon to give all round small arms fire. Throughout the 1930s, gunnery practice was devoted largely to the anti-tank role with the tank firing on the move. During this period the importance of extreme accuracy in tank-versus-tank warfare was not adequately stressed, for it was generally thought sufficient to merely to obtain a hit on a full-size tank target, but not to target and hit a point target such as the gun mantlet or the turret ring. Experience early in World War II rapidly revealed the fallacy on which pre-war training had been based, for which a hit somewhere on the target tank might result in a mobility kill if, for example, a track was destroyed or part of the drive system or running gear was damaged, the hit tank still retained a measure of offensive capability if its turret and gun were still intact. However, if the mantlet or turret ring was destroyed, the tank lost its entire military value. The geared traverse and elevating gun controls of the Vickers medium tanks were replaced in light tanks, from 1932 onward, by geared traverse and shoulder-controlled elevation. In 1938/39 there appeared the new Ordnance QF 2-pdr Mk 9, and this was installed in the A9, A10, A13 cruiser tanks and the A12 Matilda infantry tank. This 287-lb (130-kg) weapon was of smaller-calibre than the 3-pdr gun, at 1.575 in (40 mm), but had a 50-calibre bore and fired its 38-oz (1.08-kg) solid shot with a muzzle velocity of 2,800 ft (853 m) per second. This yielded the capability to penetrate 57 mm (2.24 in) of armour, angled at 30°, at 500 yards (457 m). The gun was installed in the turret and offered greater protection than that of the Medium Tank Mk 1, and was therefore somewhat heavier. This inevitably meant a turret of greater weight, and the earlier type of manual traverse arrangement was no longer adequate. Powered traverse was therefore introduced. This was at first of the hydraulic type, based on that of the Frazer Nash aircraft turret, but there were constant problems with the hydraulic ‘plumbing’ and high pressure of the fluids they carried, so hydraulic power turret traverse was soon superseded by electric power turret traverse, and this latter then became (and remains) standard to this day. The 2-pdr gun was an extremely accurate shot-firing weapon, and in theory was capable of piercing the armour of any known German or Italian tank at any range out to 1,200 yards (1100 m). However, early wartime experience soon revealed that the gun was not as useful as had been believed, and for practical purposes it was ineffective against German equipment such as the PzKpfw III medium and PzKpfw IV battle tank as the shot shattered on impact with the German tanks’ face-hardened armour. In other countries a more realistic point of view was evident in tank armament. Although German anti-tank weapons in 1939 were of 37-mm 1.46-in) calibre, their tanks at that time mounted either a 50-mm (1.97-in) gun, and by 1940 the Germans had a 75-mm (2.95-in) gun in service, each of them firing a shell with sufficient HE content to deal with the entrenched machine gun or anti-tank gun which could not be tackled effectively by a shot-firing weapon. In this capacity the Germans had thought further ahead than the British, and were supported by a government prepared to spend large sums on the equipment needed by their forces. The British, hampered by treasury limits which would not allow the creation of tanks with the larger turret ring that would have allowed current types to be upgunned as necessary, were therefore limited in the short-term to the 2-pdr gun. The Germans, foreseeing that larger-calibre guns and the ability to fire both shot and shell would soon be necessary, invested in tanks with turret rings that made possible the installation of more substantial turrets with larger-calibre guns. Even after the British had come belatedly to appreciate the need for tank guns of larger calibre, the fielding of such weapons, namely the Ordnance QF 6-pdr Mk 3 of 2.244-in (7-mm) calibre and the Ordnance QF 17-pdr Mk 2 of 3-in (77-mm) calibre, was delayed by air raids and production difficulties. Moreover, both of these weapons, which offered excellent armour-penetration capability at the time of their introduction, had been designed for the anti-tank role and therefore still lacked the capability to fire HE shell, and while their installation in current tanks was strongly urged, the small diameter of the turret rings of current British tanks made the mounting of larger guns difficult. On the battlefields of France in 1940 and the Western Desert in 1940/41, the Matilda proved immune to the 37-mm (1.46-in) German and Italian anti-tank weapons, but then the Germans introduced their 75-mm (2.95-in) PaK 40 anti-tank gun and also started to make widespread use of their excellent 88-mm (3.465-in) FlaK 36 and 37 anti-aircraft gun in the anti-tank role: the high muzzle velocity needed to provide the ability to tackle high-altitude aircraft, which gave the 88-mm weapon prodigious anti-tank capability. 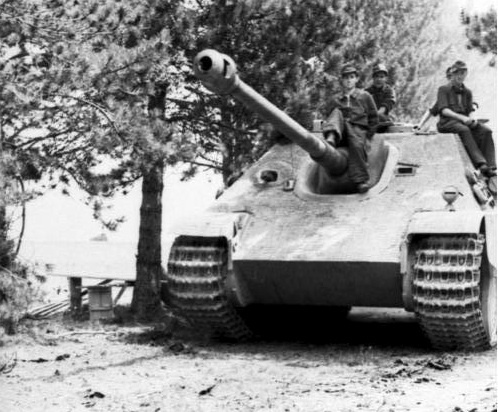 The FlaK weapon was then used as the basis for the PaK 43 dedicated anti-tank gun, arguably the finest anti-tank gun of World War II, and the KwK 36 gun used in the PzKpfw VI Tiger I and Tiger II heavy tanks as well as the Jagdpanther tank destroyer. In the Western Desert the British position was made more difficult still by the advent of the PzKpfw III Ausf E/H with a 50-mm (1.97-in) gun and the PzKpfw III Ausf N with a 75-mm (2.95-in) gun, in each case a low-velocity weapon firing a shot and shell, but more significantly the PzKpfw IV with a low-velocity 75-mm (2.95-in) gun later replaced by a longer-barrelled and therefore high-velocity gun of the same calibre. Both the 50- and 75-mm (1.97- and 2.95-in) German guns outranged the British 2- and 6-pdr guns and, as a result, 25-pdr gun/howitzers of the Royal Artillery were used in the anti-tank role to support infantry. The British 3.7-in (94-mm) anti-aircraft gun was never used as an anti-tank gun as the Germans used the equivalent 88-mm (3.465-in) weapon.